How does the skull keep itself poised at the top of the body? The majority of those who study the body maintain that the skull rests entirely on the first cervical vertebra, supported by the muscles of the neck. These scholars state that the jaw has no influence whatsoever on the posture of the skull. In the next pages we will see that this is true only in part. The reality is in fact more complex. To understand how the skull is supported it is necessary to observe it in two separate moments: the moment when it is at rest, and during swallowing. The moment of repose is that between one swallow and the other and is the normal condition, the one in which we find ourselves for longer period of time. During this phase we carry out the common activities of daily living (speaking, breathing…). In this phase the skull rests almost all its weight on the first cervical vertebra. The small remaining portion of weight is loaded onto the dental arches during occlusion (don’t confuse occlusion with swallowing). For example, when we speak the jaw does not contribute any more to the maintenance of the skull. In that moment the entire weight of the skull rests on the first cervical vertebra. In this case the skull is stabilized by the muscles of the neck. Swallowing is that very short (less than a second) and intense phase in which the dental arches stabilize the skull. This phase is important because the skull does not only discharge its own weight, but, with the work of the masseter muscles, comes to produce an average of 30 kg that are discharged and distributed onto the dental arches. Thus we can see that the skull has two different supports (the dental arches and the first cervical vertebra) at two particular moments (swallowing phase and occlusion phase). These supports are always present, but according to the needs of the moment, one or the other dominates. But what role does the jaw play, other than to stabilize the skull? As we have seen the skull rests on the first cervical vertebra which allows for ample rotational movement. The vertical line of the body’s center of balance passes through that point. Vice versa, the center of gravity of the skull (f.c.g.c. ), further forward than the vertical axis, is found to its left (see picture 30). Due to the pressure of the force of gravity and the muscular forces on the point of f.c.g.c., situated to the left of the atlanto-occipital area, the skull tends to roll forward. This happens because the skull sits securely anchored in the atlanto-occipital zone, but undergoes pressure from above at the point of f.c.g.c.. Thus the skull, in the occlusion phase, under the impetus of its own weight, rotates on the atlanto-occipital joint until discharging the lesser part of its own weight onto the jaw. At the moment of occlusion in which the planes i and j meet, we have Newton’s Third Law, described previously. If the body i exerts a force on j, the force that j exerts on i is “simultaneous”. It should be said that there are two forces that operate the lever: the fm and the fcgc, which constitute F (fm + fcgc). 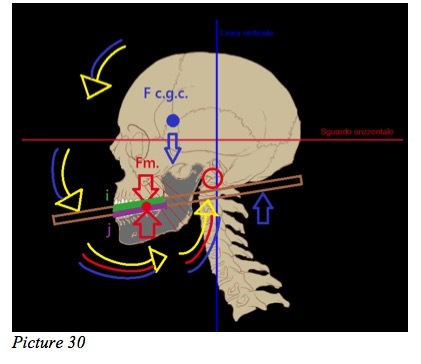 Thanks to the muscles of the stomatognathic apparatus, which act on the jaw, part of the weight of the skull is redirected to the interior of the circuit, as happens in picture 30. In practice the jaw retrieves the weight discharged by the skull in the occlusion phase, to keep the skull in posture. This passage will become clearer, while continuing with the reading of the text, thanks to another important principle: that of the lever.